September weather patterns were anything but spring-like. “The typical wild westerlies of spring have been absent during recent weeks,” said MetService Meteorologist Georgina Griffiths. High pressure camped out over the South Island, with persistent easterly winds across the North Island. For most of the South Island, this pattern produced a rather dry September, while many northern and eastern regions of the North Island experienced a very wet end to the month. But a major shift in the weather patterns is about to take place. “Spring is about to arrive with a bang, with westerlies set to kick-start October,” Griffiths noted. Equinoctial gales and fast-moving fronts are signalled to start the month, followed by frequent low pressure that is likely to favour the North Island. 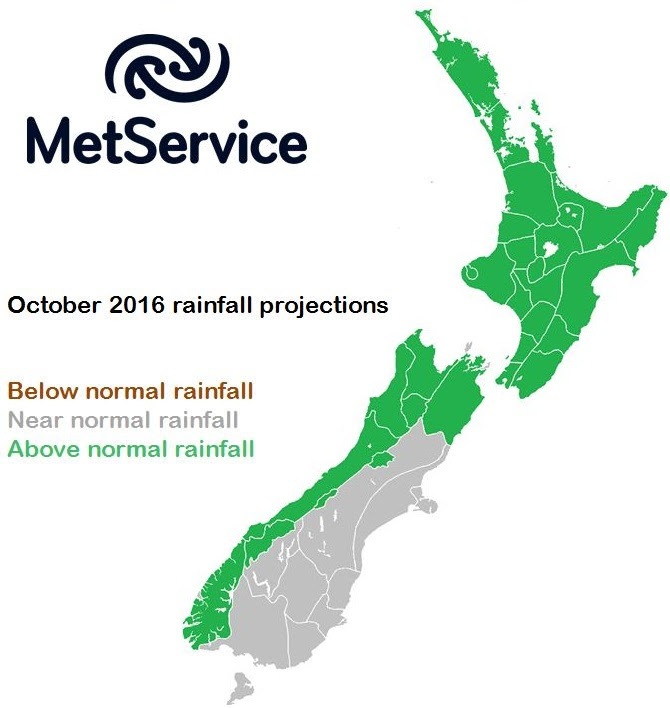 In line with these unsettled weather patterns, a wetter than usual October is predicted for most of New Zealand. The exceptions are Canterbury, Otago and Southland, where closer to normal October rainfall totals are forecast. After the recent rain in Gisborne and Hawkes Bay, people there may be relieved to know that October starts out on the drier side, before a wetter second half of the month.